There’s not much to tell about Upon Ruins, other than them being a Canadian four-piece melodic death metal band hailing from New Glasgow, Nova Scotia. They have a musically widely oriented, but rather traditional line-up with Howard Young on lead and rhythm guitars, Shane Forsyth as vocalist and rhythm guitar player, Paul Shaw on bass and Greg ‘Gregadeth’ Thompson on drums. Wait, what? No keys, no arrangements, no choirs, just a rhythm section, some guitars and a singer who together play melodic death metal with thrash and viking influences? That could actually be quite refreshing in these times of abundancy. Their timeline has been equally traditional until now: Two years after coming into existence in 2014 they released a demo, The Endless Sands, and two years later they are ready for the release of their first full-length called Legacy of Desolation. Knowing this it’s hardly a surprise their musical preferences and approach tend towards the traditional as well, something they most likely have translated into their sound and lyrics, the latter covering the conflicts of past civilizations and their legacy. Opening intro The Oncoming Storm, audible in the distance by the way, clears the path to actual opener Where Mountains Collide that, as expected, indeed has a traditional feel to it. If there would be a protocol describing how to start a death metal song, this could very well be used as an example. Guitar riff in your left ear, drums, rhythm guitar and bass coming in from the right, all building towards a fast, heavily drum-backed rhythm, only to slow down a few seconds later. And then the growling starts. Vocalist Shane does not possess a particularly distinctive grunt, but it simply fits the music as it should. There’s a second vocal, serving as a grunt-accompanying background vocal, which is clean and pleasantly present. This gives the song a bit of a viking metal vibe, which fits the lyrics that tell of a battle back in the day when disputes were settled with sword and shield and the inevitable consequences of said battle. True to their intention that is the recurring lyrical theme: in every song a different battle is covered, all ending with a grim picture painted in words, all framed in a carefully composed, atmospherically fitting musical frame. Even the short semi-acoustic intermezzo Forlorn Hope doesn’t feel out of place. To me it’s some sort of moment of reflection, awareness if you will, right before the title track kicks in, in my opinion the pinnacle of the album. It’s an over seven minute spanning slow, heavy song with a beautiful intermezzo and an atmosphere that perfectly reflects its title. But in all honesty, there really is not a single bad song on this album. It’s safe to say Upon Ruins plays melodic death metal that is heavily influenced by various types of traditional metal, of which thrash is the most distinct. Although in essence not innovative or original in itself, their music has enough variation and added personal touches to keep things definitely interesting. 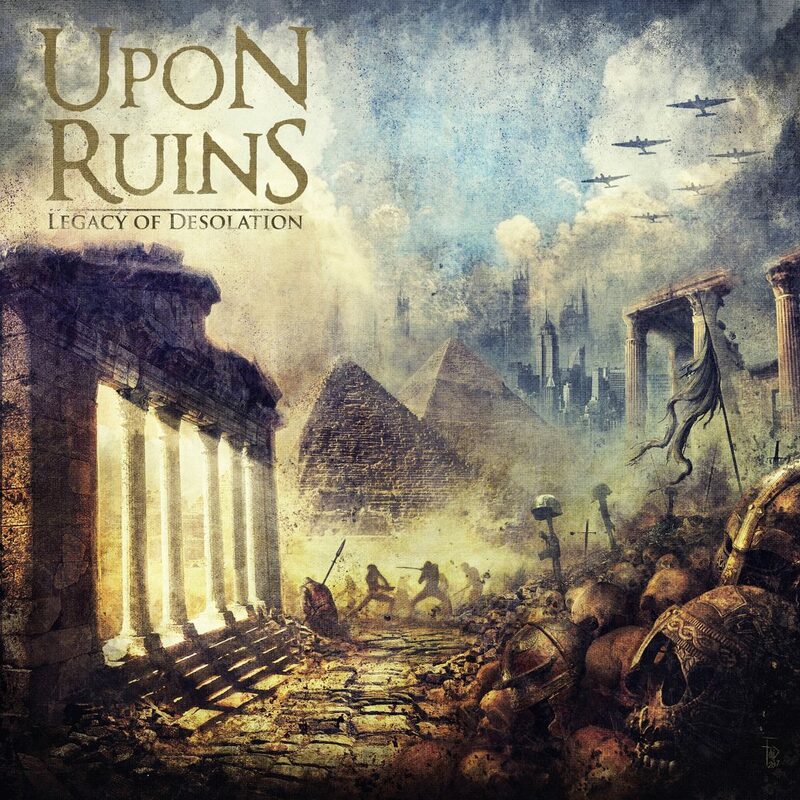 Rather than spending a lot of precious time trying to re-invent, modernize, complicate and/or innovate metal, the guys from Upon Ruins have chosen to compose songs with a familiar structure, based on personalized, but unmistakably traditional metal and I can only applaud that. Don’t get me wrong, there is nothing wrong with being innovative and original or adding all kinds of extras to your music, not at all, but I equally desire straightforward traditional metal with subtle personal touched, and Upon Ruins simply fills that desire. With Legacy of Desolation they have delivered a solid piece of work filled with great songs that have a pleasantly familiar feel to it. Nothing more but, more important, certainly nothing less either. An album that will appeal to a wide variety of metal fans and that has definitely put Upon Ruins on my radar. Liked!